The festive season has ended and I for one have perhaps over-indulged (for me) in a variety of different beverages which I associate with Christmas. I do enjoy having a sip of sherry but I ran out after I used the last of the bottle in a delicious sausage casserole earlier in the year. I've tried a Belgian chocolate Bailey's luxe edition which was rich and creamy and very warming but I have above all enjoyed mulled wine or cider this holiday season. I attempted mulled cider in the slow-cooker on Christmas Eve and Christmas Day; the slowcooker was filled with dry cider, a handful of soft brown sugar, a stick of cinnamon which I am steadily growing used to, plus two teabags of mulled spices. Left on the hot setting, it created a well-steeped, flavourful mulled cider with a heady aroma. Rob and I tried a bottle of ForestGlow Swedish Mulled wine/glogg just before Christmas and we were very impressed at the flavours and yes it did rather give us a bit of a glow, being 15%! First impressions; the bottle is unlike the typical wine bottles one would find in the supermarket or farmer's market. It feels robust due to the lack of typical wine bottle curvature into the neck which is much shorter. It looks more like a fancy spirit bottle and if I can locate the stopper I would definitely sterilise it to use it again, perhaps to make a flavoured gin or vodka. The front label features the ForestGlow tree emblem with an enchanting forest illustration capturing a Swedish woodland scene complete with wildlife, all in various shades of red to represent the flavour - the bottle we tried has a hint of red berries. "handcrafted in the middle of wild forests in Sweden and is based on selected red wine from Europe"
"elegant, inviting and created to spread warmth and happiness"
using a "magical blend of spice and berries"
Overall we couldn't agree more that it does indeed spread warmth, mostly due to the alcohol volume which is quite high at 15% thanks to the combination of good Spanish red wine with elegantly spiced vodka. The medium-sweet blend is perfect and the balance between the tradtional spices cloves and cardomon and the sweetness of the red berries can be enjoyed whether the drink is served hot or cold. We tested both and although flavour-wise the glogg is the same, the overall drinking ambience is heightened if it is served hot, warmed using a saucepan or if you should own one, a mulled wine warmer. I'm going to accept the Swedish way of drinking mulled wine; with friends and family as an aperitif with blue cheese. This sounds wonderful and authentic but in the UK at least mulled wine is associated as a drink to be consumed only during the festive December season. If this drink was served as the nights start to draw in, in bars and at restaurants I would certainly order a couple of glasses for myself and Rob to enjoy. 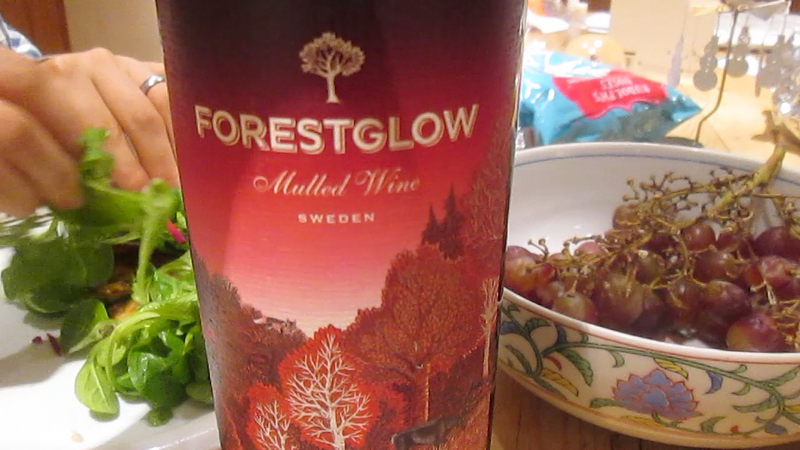 I look forward to enjoyed ForestGlow Swedish Mulled wine again very soon. Visit Freyja's Wines to take a look as it is still in stock there.